RAM Spreaders’ SingFlex Twin40 Headblock becomes integral part of London Gateway Container Terminal and secures a repeat order. Tandem lifts with the RAM Spreaders’ Twin40 headblock system (SingFlex) have been a significant factor in achieving world leading productivity and operating flexibility at London’s new, state of the art container terminal London Gateway operated by DP World. RAM SingFlex head block has been installed on the terminal’s new single hoist ship to shore cranes increasing vessel productivity and ensuring that world class handling rates are achieved. The headblocks have been in operation since the terminal opened in November 2013. A new order for the second phase of the terminal has been placed with RAM for a further 4 SingFlex and 9 STS spreaders. The repeat order is a show of faith in a reliable product. SingFlex is a tandem headblock system which has been designed for use with conventional single hoist cranes. It offers the terminal operator tandem lift capability without the need for expensive dual trolley cranes. Each SingFlex headblock system is fitted with two RAM separating twinlift spreaders, providing the terminal operator with the flexibility of handling single 20ft, 30ft, 40ft and 45ft containers in the conventional singlelift manner. Alternatively, the operator can handle 2x40ft containers, 2x45ft containers or 4x20ft containers in tandem mode. The SingFlex headblock features RAM’s patented auto-connector which allows the crane operator to switch between single spreader mode and tandem spreader mode in a fully automated manner and without assistance from support staff. The automated change over from single to tandem mode, and vice versa, is performed by the crane operator and is achieved in less than 2 minutes. The rapid change over facility allows the operator to select the mode most suitable for the work schedule ahead, maximising productivity at every opportunity by deploying tandem spreader mode whilst minimising any external disruptions to operations. The crane operator has the ability to adjust the gap, skew angle, full gap adjustment, offset capability and longitudinal offset between the spreaders and containers. After more than ten years of development with units operating in China, Singapore and North Africa, SingFlex saw its first commercial operation on 8 cranes at London Gateway and was recently followed by 19 automated cranes at DP World’s flagship Jebel Ali Terminal 3. To attract the biggest ships, terminals must be able to provide a fast turnaround to get the vessel back to sea quickly. 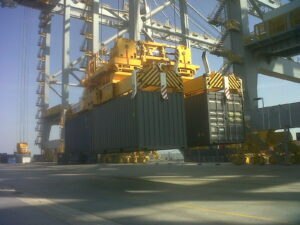 In the case of London Gateway, using SingFlex makes them the only container terminal in the UK with a capability to lift two 40ft containers or four 20ft containers at once. This results in faster operations attracting bigger ships and more business to the port. SingFlex allows terminals to work tandem operations for less than 3% of the cost of a ship to shore crane. That coupled with the fast change over from single to tandem means that terminals can get all the benefits of Tandem 40 handling, for a much lower cost.